Claire was working as a chiropractor and had reached the highest level in the sport of eventing when a freak accident left her paralysed from the chest down. She had gone from living a life as an active sports women whose dreams were coming true, to a life that seemed impossible to ever be happy. The simplest of tasks were now a challenge for Claire. Many doors had closed, and it was difficult not to dwell on all she had lost. She had to dig deep to find the strength and courage to rebuild her life from scratch. Claire Lomas was working as a chiropractor and had reached the highest level in the sport of eventing when a freak accident left her paralysed from the chest down. She had gone from living a life as an active sportswoman whose dreams were coming true, to a life that seemed impossible to ever be happy. The simplest of tasks were now a challenge for Claire. Many doors had closed, and it was difficult not to dwell on all she had lost. She had to dig deep to find the strength and courage to rebuild her life from scratch. Claire discharged herself from the hospital after only 8 weeks, determined to do as much rehabilitation as possible. She spent hours in the gym but also recognised that she needed more than this in her life. Claire has found new sports including skiing, set up a business, written a book and organised fundraising events. Her life was totally different, but it did have one similarity, she was busy again. In 2012 Claire became headline news worldwide. 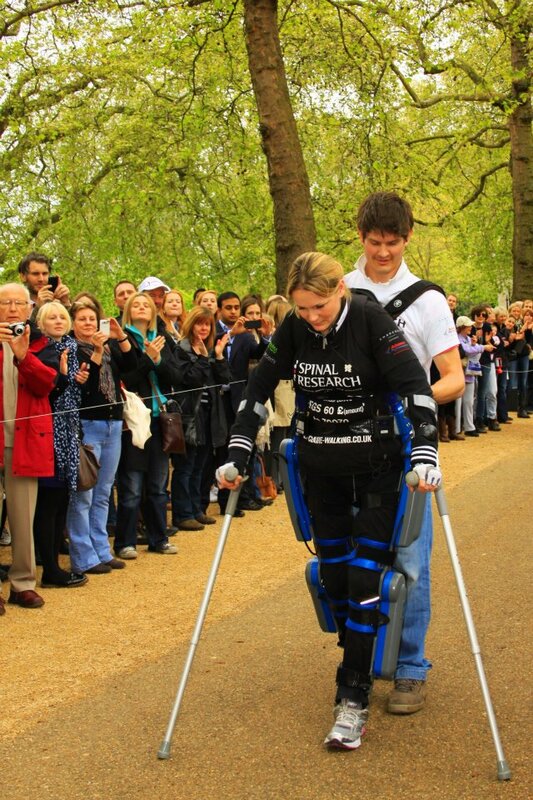 She walked the London Marathon in a pioneering robotic suit. It took a gruelling 17 days and raised £210k for Spinal Research. She became the first owner of a robotic suit and used it when she had the honour of lighting the Paralympic cauldron in Trafalgar Square. In 2013 Claire completed a 400-mile handcycle around parts of England, visiting schools on the way to inspire pupils, raising another £85k supporting the Nicholls Spinal Injury Foundation. 2014 and 2015 took the fundraising total to over £500k through various events Claire organised. In 2016 Claire completed the London Vitality 10k in 12 hours and completed the Great North Run in September whilst 16 weeks pregnant. Claire completed her latest challenge, #10in24, in October 2017 which saw her walk the 10 miles of the Great South Run in 24 hours, walking through the night and completing the challenge with a few minutes to spare! She is constantly thinking of ways to raise money and her challenges will continue as she strongly believes there will soon be a cure for paralysis. This year, she’ll be taking on another huge challenge and walking the Greater Manchester Marathon, aiming to smash her 17-day record! Claire talks about the gradual process of turning her situation around, and surprisingly how the best five days of her life have all been after her devastating injury. She describes the turning point which was when she stopped thinking of everything she could no longer do, and instead the many things she could still do. She speaks publicly about the split second that changed her life, and candidly describes the darkest times. This is combined with humour, which has helped Claire get through some embarrassing moments that her injury has caused. The audience goes through the extreme roller-coaster of emotions with Claire; they cry, they laugh and they admire. She demonstrates her robotic suit, and you could hear a pin drop as everyone is fascinated by the pioneering technology. As Claire walks across the room people are in awe that she managed 26.2 miles in the streets of London when she can’t even feel the ground beneath her. Claire challenges her audience to raise their sights, make their own luck by taking opportunities and be the best they can be. People leave the room believing in themselves, inspired and hugely motivated. When faced with challenges in their own lives, Claire’s words stick in their mind “Whether you believe you can or whether you believe you can’t – you are right”.